Earth Day (April 22) is just around the corner. The super-crafter behind Hydrangea Hippo has created, what I think, is the perfect Earth Day craft with her Upcycled Globe. Creative upcycling and paper crafts?!? Sign me up! She has used a large hole punch and some pretty paper to cover the outside of a damaged tabletop globe. Thanks to the simple instructions and basic materials, this is a DIY that anyone can handle. This globe could be recreated with any type of paper. Maybe some lace doilies, or paint chips in an ombre pattern? Old maps or the pages from an atlas would be perfect! 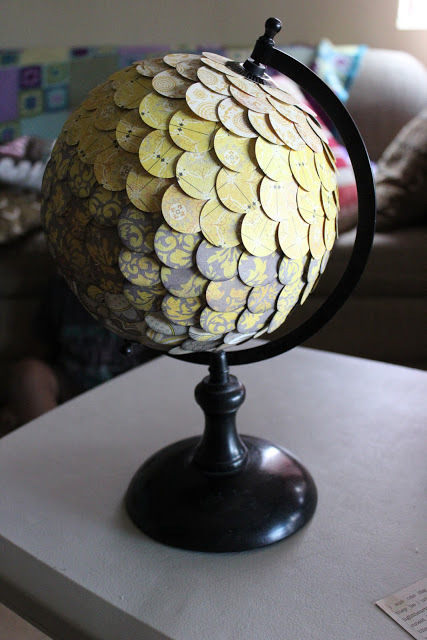 What other materials could you use to repurpose a globe?